Post-traumatic stress disorder (PTSD) is a medical condition that may become severe enough to interfere with your ability to work. If this happens you may be eligible for Social Security disability. Intrusive memories. Flashbacks, nightmares, and reliving a traumatic event can all interfere with your ability to function normally in day-to-day living. These memories can cause you to lose sleep and avoid contact with the outside world if they are severe. Avoidance and emotional numbing. This set of PTSD symptoms involves how you perceive and interact with the world around you. For instance, you might go to great lengths to avoid talking about or even thinking about the event that caused your illness. You may also experience problems with memory and concentration. Personal relationships may be difficult, and you may view your future as hopeless. Increased anxiety or emotional arousal. 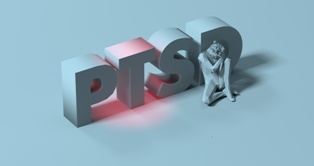 PTSD also can affect your emotional responses to everyday occurrences. For instance, you may find yourself feeling unreasonably angry, unable to sleep, easily startled, or even seeing and hearing things that are not there. You may feel defeated by guilt or shame and even engage in self-destructive behaviors. Any one of these symptoms can be a disability if it is severe enough. However, the symptoms of PTSD are difficult to document, so many deserving applicants are denied Social Security disability benefits. A Social Security disability benefits denial is not the end of the road. The majority of Social Security disability applications are denied—often because of technical mistakes on the application or missing information. If you have PTSD and this has happened to you, then we encourage you not to give up. No single test can conclusively confirm that you have PTSD. Accordingly, you need significant medical documentation about your condition and you need to present that evidence to the Social Security Administration. If you have PTSD and your application for Social Security disability benefits was denied, then we invite you to contact an experienced Social Security disability lawyer as soon as possible. Our caring and compassionate staff will study every aspect of your claim and present the right evidence to the Social Security Administration. We will file all of your paperwork, represent you in all hearings, and take the burden off of your shoulders. For more information or to schedule a free consultation, please start a live chat with us now or call us at any time.